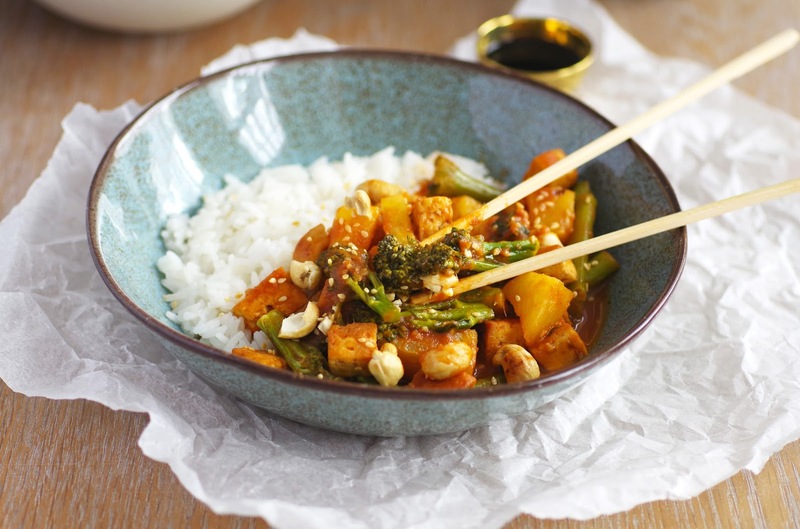 I spent last weekend at my Parent's house for Easter and when it came to dinner time, I was thinking about how to spruce up my mum's plan for a stir fry dinner. Don't get me wrong, stir-fries can be great, but it was the beginning of a bank holiday weekend and I really fancied something a little more indulgent. We'd already picked up some vegan wontons and enoki mushrooms in town for the planned stir fry and when it came to cooking, I thought I'd have a go at making another dish, turning it into a little Friday night Chinese fake-away. You can thank the pineapple sitting on my parent's window sill for inspiring this dish...crispy tofu meets tender broccoli, with juicy chunks of pineapple and toasted cashews & sesame seeds, all coated in the easiest, most incredible tasting sweet and sour sauce! This sweet and sour dish is loaded with protein from the tofu, broccoli, cashews and sesame seeds, as well as generous amounts of vitamin C, iron, vitamin E and calcium, it's ready in under 15 minutes and will serve 2 as a main, or 4 if you're having other dishes too! 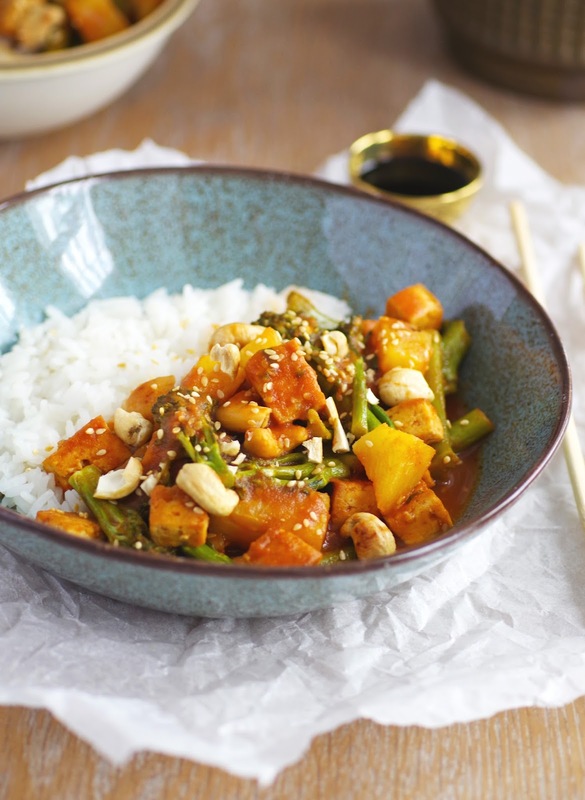 Simply put the rice on the boil and then toast up the cashews and sesame seeds, crisp up the tofu whilst you're making the sauce, add in the rest of the ingredients and simmer for 3-4 minutes, it really couldn't be simpler - or tastier! Boil the rice for 10-12 minutes and then drain. Meanwhile, toast the sesame seeds and cashew nuts in the frying pan/wok until golden, transfer to a bowl and put to one side. Cut the tofu into 1cm cubes and fry in a splash of sesame oil until crispy and golden brown. Meanwhile, make the sauce by adding the pineapple (including the core) down to the water in the ingredients list into a blender and blitz until smooth. 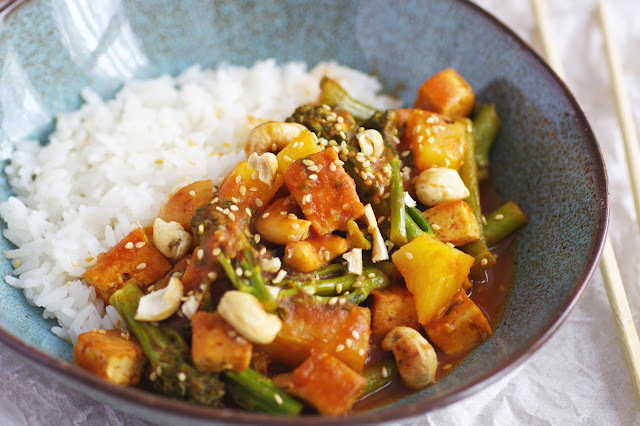 Cut the broccoli into 4 pieces and the pineapple into chunks and add to the pan along with the sauce and half of the cashews and sesame seeds. Simmer for 3-4 minutes, until the broccoli is tender. 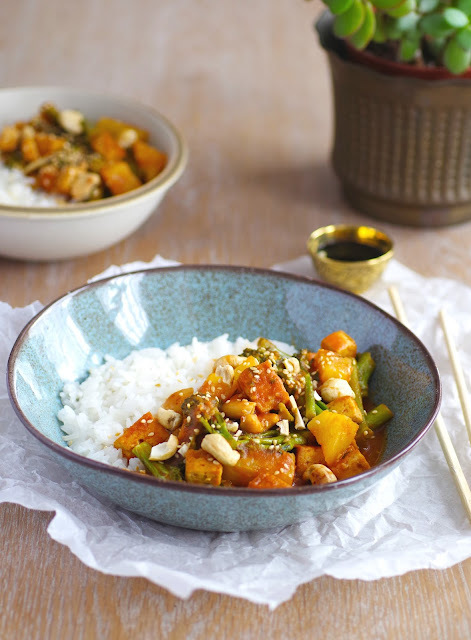 Serve up the sweet and sour with a side of rice and sprinkle over the toasted cashews and sesame seeds and enjoy!